See my Etsy product reviews! Sugar-Free Baking Can Be Sweet! 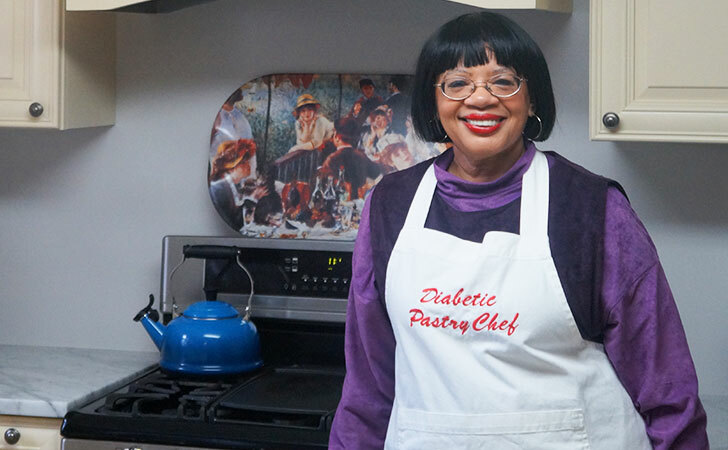 Shortly after attending culinary school to become a pastry chef, I was diagnosed with diabetes. Mercy! I was devastated, as I absolutely loved to bake and loved to eat sweets. I experimented with a lot of artificial sugar free sweeteners and was mainly disappointed with the results. I thought, there has to be a better way to bake great tasting products from my kitchen that will be enjoyable for diabetics to eat. After all, our love of eating is what got most of us into this mess to begin with! After many experiments, I developed a formula that consistently turned out delicious sugar-free and low-sugar confections that even non-diabetics love. The recipes I have posted are adapted to my preferences and dietary needs; I encourage you to adapt them to yours. If you do not want to use white flour, I suggest you use the flour you are most comfortable with, such as oat, soy or almond flour. You may prefer to use sour cream in place of yogurt, or stevia in place of sugar, whole milk or lowfat milk, etc. This is all your choice. My recipes are only guidelines as to how to modify recipes to suit your dietary needs while retaining the most flavor. This blog contains the methods and results of my pastry creations. I am sharing my techniques in the hopes that you will experiment and perform your own culinary wizardry! The Diabetic Pastry Chef™ does NOT claim to offer the lowest-carb recipes and products on the market. I do claim to use premium-quality, natural ingredients in my products to lower the carbs, so neither health nor taste are unduly compromised, but are rather enhanced. – Best of all, you don’t have to be diabetic to enjoy my sugar-free and low-sugar pastries & confections!